Welcome to the CMS Music Boosters and Evening with the Arts Concert Series Home Page! CMS is hosting the NHMEA Southeast District Festival on May 11th. We need lots of parent help. Please use the link below to sign up to donate items or volunteer some time to make this huge event successful. FYI: Work for Liberty Mutual? The CMS Music Boosters can be your designated Give with Liberty donation choice! Yahoo! Help support CMS Music Boosters by selecting us on Amazon Smile. Click on the link below and sign up. Its easy. Just shop as you usually would on Amazon, but enter through smile.amazon.com. Livingston Taylor at his January 29, 2012 concert. 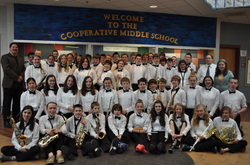 The CMS Music Boosters are a 501(c)3 non-profit organization that meets regularly at the Cooperative Middle School in Stratham, New Hampshire. The Boosters are dedicated to supporting the music programs at CMS, and we welcome you to any and all meetings. We are currently planning our 2013-2014 programs, including our popular Evening with the Arts Concert Series. Please click on the meeting tab above to find out when our next meeting is scheduled. We welcome you anytime! We need volunteers to advocate for our school music programs, to assist the music staff with organization of music and fundraising, to bake for concerts and special events, and to plan and run our concert series. 11/6 - Information Meeting - CMS Musical “Once Upon A Mattress - 2:15-4:00 p.m.
11/13, 11/15 and 11/16 - CMS Musical Auditions - 2:15-4:00 p.m.
12/4 - Grade 6 Chorus Concert - 7:00 p.m.
12/5 - Grade 7 Chorus Concert - 7:00 p.m.
12/7 - Grade 8 Chorus and Chamber Choir Concert - 7:00 p.m.
12/13 - Grade 8 Band Concert at EHS - 7:00 p.m.
12/14 - Grade 8 Orchestra Concert at EHS - 7:00 p.m.
1/08 - 6th and 7th Grade Orchestra + Encore Strings Concert - 7:00 p.m.
1/9 - 6th and 7th Grade Band Concert - 7:00 p.m.
2/2 - CMS Drama trip to “Love Never Dies” - 5:30-11:30 p.m.
3/16 - CMS Musical - 7:00 p.m.
3/17 - CMS Musical - 1:00 p.m.
5/22 - 6th Grade Chorus Concert - 7:00 p.m.
5/23 - 7th Grade Chorus Concert - 7:00 p.m.
5/28 - Memorial Day Parade (all band students) - 1:00-2:15 p.m.
5/29 - Tri-M Induction Ceremony - 6:00 p.m.
5/29 - 6th and 7th Grade Band Concert + Jazz Band - 7:00 p.m. URGENT: IF YOU HAVE ACCESS TO A PROFESSIONAL SPORTS TEAM'S TICKETS, WE NEED HELP! Last year, we had a very successful raffle of Bruins tickets and a hotel stay in Boston. If you have similar items that you could donate to our cause, please let us know! This beautiful tree was decorated by the CMS Music Boosters and is available for auction on November 29th at the Exeter Festival of Trees. Proceeds benefit the Chamber Childrens' Fund. Look for our tree again at the 2013 Festival! The CMS Wind Ensemble commission local composer Brad Chiechomski. 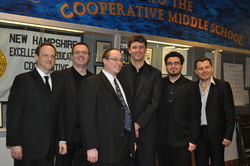 'While Exeter Slept" had its world premiere at CMS on May 31st, 2012, with Mr. Chiechomski directing. The students met with the composer to develop the theme of the piece, and settled on basing the music on the 1963 UFO sightings near Exeter. The music reflected the fascination and fear of the encounter with an unknown, glowing spaceship in the woods. 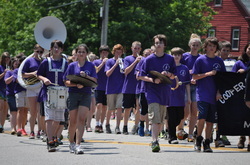 CMS band marches in Stratham Memorial Day Parade. CMS students marched in the parade, and played at the ceremony at Stratham Hill Park. CMS Band Director Eric Kobb with the Boston Brass. For more photos, click on our Evening with the Arts Concert Series tab above. Did you know that the CMS Music Boosters can use your unwanted textiles? We accept donations of shoes, clothes, pocketbooks, sheets, towels, draperies and stuff animals in our large bin by the front soccer fields. (No rugs or pillows please!) Just follow the fence by the soccer fields in the front of CMS, and look for the bin decorated with flowers and butterflies by the storage shed on your right. We get paid by the pound for your unwanted fabric items and the textiles are used in 3rd world countries. Its a win-win! Please consider filling our bin!